This is the official press release of the ADTF, CIJ’s full report will follow soon. The Antwerp Diamond Trade Fair concluded on Tuesday, January 28, with many participants praising it as the best fair since it was launched in 2010. "The show has come into its own," said Frederic Dawidowicz, sales manager at Royal Gem, an Antwerp-headquartered firm with international operations,. "It’s a show that not only demonstrates the power of Antwerp as the world’s most dynamic diamond trading centre, but also a very effective and practical tool to bring buyers into the diamond district to meet a good number of diamond companies and thus lower the threshold for the buyers’ future visits." Across the board, the exhibitors agreed that the fair’s performance had been significantly better than in 2012, with a noted improvement in the quality - and the quantities - of the visiting buyers. 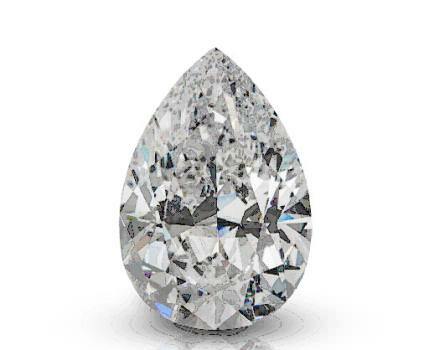 An exclusive diamond (30-carat-plus pear shape, top colour, loupe-clean) shown at the fair, by RDH Diamonds. Alan Bick, a jewellery manufacturer based in London, said that while he was not a newcomer to Antwerp and its diamond industry, the format and the wide range of exhibitors at the fair enabled him to find and add several new suppliers to his list. "I came here for one day and was able to cover all three halls in the course of the day before heading home in the evening," he said. "I think this a great concept and I hope the bourses will continue to hold it annually." Deco Consult of Brussels, the ADTF’s organizing company, reported that around 500 pre-registered buyers had attended the fair, and more than 200 other jewellery manufacturers and retailers had registered on the fair’s web site. In total, around 1,000 visitors visited the three trading halls of the Antwerp Diamond Bourse, the Diamond Club of Antwerp and the Antwerp Diamond Kring exchanges,. which had been converted into three elegantly designed exhibition spaces. The organisation said the dates for the sixth edition of the Antwerp Diamond Trade Fair are projected for January 25-27, 2015. 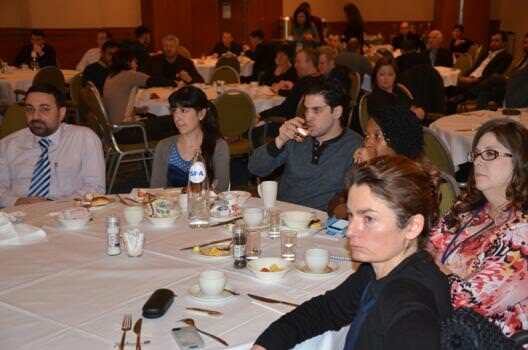 Some 150 visitors and exhibitors attended the WDM seminar. 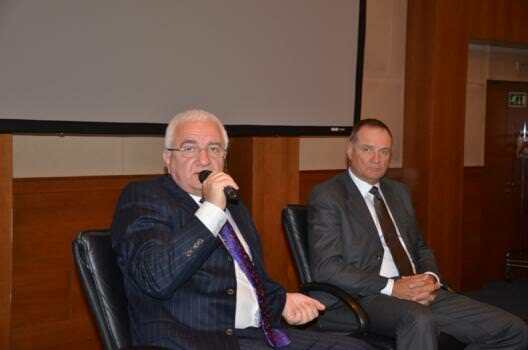 Meanwhile, Ernest Blom, vice chairman of the World Diamond Mark Foundation (WDMF), and president of the World Federation of Diamond Bourses (WFDB), and WDMF Chairman Alex Popov spoke at the second Breakfast Seminar. They described how the World Diamond Mark has been founded by the WFDB to address the core issues of consumer desirability through generic marketing, consumer and media confidence in the integrity of our product, consistent high quality educational programs and a commitment to ethical standards throughout the supply chain. So far, it has made strong progress and has succeeded in gaining the support of some of the industry’s key players, Blom said. Alex Popov (left) and Ernest Blom answering questions from the audience. The World Diamond Mark is based on three core activities, which include education and training of the jewellery retail business community about diamonds through the Authorised Diamond Dealer concept of accredited retailers; confidence building with the consumer through the WDM’s Authorised Diamond Dealer retailer accreditation programme, and generic consumer marketing and promotional programmes in core markets for diamonds and diamond jewellery, to improve diamond jewellery sales and market share, in collaboration with a leading consumer credit card company as global sponsor. Dacques J. Nini, a jewellery retailer from Houston ,Texas, said he was very encouraged by the generic diamond promotion campaigns and initiatives as shown by Popov and Blom. " It is great to see that the industry is taking its fate in its own hands and I look forward to learning how I can implement the WDM programmes in my own retail jewellery business. And as a fair focussing on retail-jewellers, the ADTF did us a good service by offering the WDM a stage,"
The Antwerp Diamond Trade Fair is powered by the AWDC.